For over thirty years, the Ignitor has proven itself in applications ranging from race cars to tractors. The Ignitor replaces breaker point and troublesome factory electronic ignitions with a dependable, self contained and maintenance free electronic ignition system. The Ignitor has been called the "stealth" ignition because of its quick installation and nearly undetectable presence under your distributor cap. Delivers twice the voltage to the spark plugs, increasing horsepower, fuel economy, and spark plug life. 2:1 improvement over points in current fall time for increased coil output. Rotating cobalt magnets trigger a Hall Effect integrated circuit. Epoxy molding makes our module impervious to dirt, oil, grease and moisture. Fits entirely inside the distributor. No black box to clutter the engine compartment. Will trigger most multi-spark CD ignitions. Use with Flame-Thrower® 40,000 volt coil for optimal performance (available separately). Available for 6 and 12-volt negative and positive ground systems. Legal in all 50 states and Canada C. This listing is for a 6-volt, POSITIVE GROUND Pertronix lobe sensing Ignitor for the following applications with a 6-cylinder engine using an Autolite IGS or IAP-series distributor. The lobe sensor allows the Ignitor to trigger off the lobes of the distributor cam. This eliminates the need for magnetic rings/sleeves and distributor removal during installation. Feel free to contact our professional sales team toll-free (within USA & Canada) at 800.756.1114 or (outside USA & Canada) at 601.693.8282, EXT. Thank you for looking at our listing and look forward to doing business! The item "Pertronix Ignitor for Chrysler/Dodge 6cyl Autolite Distributor 6-volt POS 35-50" is in sale since Friday, September 28, 2012. 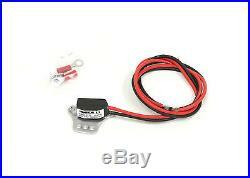 This item is in the category "eBay Motors\Parts & Accessories\Car & Truck Parts\Ignition Systems\Electronic Ignition". The seller is "falconglobal" and is located in Jackson, Mississippi. This item can be shipped worldwide.